Summerwind Charters invites you to explore the beautiful islands of the Bahamas. Spend a day with your friends and fishing buddies on the crystal clear turquoise waters. Take in all the beauty of Nasau and return to the shore with your own ‘catch of the day’. You will sail away aboard a 55’ Hatteras boat, which is called “SummerWind”. She is a fully up hauled motor yacht with plenty of space for you and nine fishing buddies. The SummerWind has a total of 1271 HP, giving her an impressive maximum cruising speed of 20 knots. She is fitted with navigational electronics to save your time while searching for fish. There is a flybridge to help you spot any action going on beneath the surface, along with a fishing chair for those who are up to a challenge. Inside, the SummerWind is air-conditioned and has all the comforts of home, including a toilet, a shower, and a bed for naps in between bites. All aboard! Summerwind Charters offers half and full-day trips that aim to show you the ‘real’ Bahamas. Captain Jamie has many repeat customers every year, because his passion and friendliness are simply contagious. Even NBA stars fish with him! 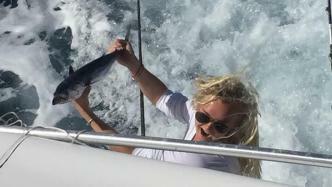 On your day, you will be able to fight with Yellowfin Tuna, test your angling skills when targeting exotic and exciting Sailfish, experience Barracuda fishing. As well as that, you will be able to target Wahoo, King Mackerel, and search for Marlin. 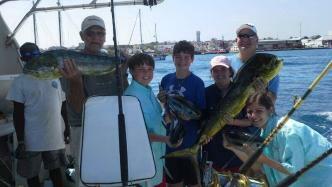 Plus, there is always a good chance to encounter Mahi-Mahi! All trips come with everything you need for fishing with light tackle, heavy tackle, and bottom fishing. You will be provided with rods, reels, tackle, lures, and drinks. Feel free to grab your own food and drinks with you. 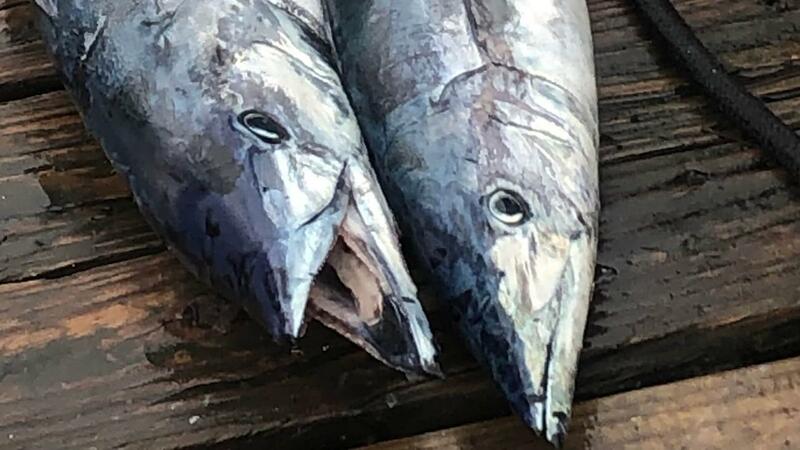 Once caught, your fish will be cleaned and filleted when you return to the shore.